Baramati in Pune district of Maharashtra is famous for Siddheswar temple and is also known for its export quality sugar and grapes. Being in the interior part of Maharashtra, Baramati does not witness much rainfall even during the monsoon season. 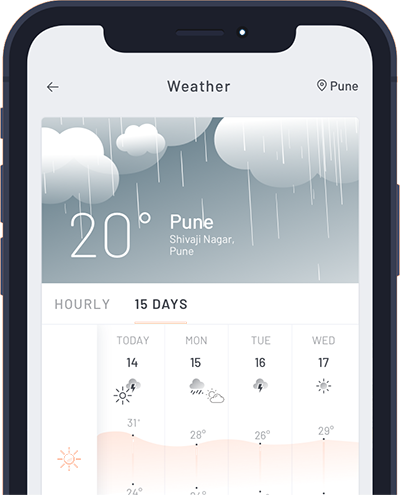 Temperatures during winter remain moderate in Baramati. The minimums could fall to 10°C while maximums remain at about 30˚C. Winter starts in December and lasts till February. Summer starts in March and ends in May. Day temperatures touch forties at times but remain in the mid-thirties throughought the period. Minimums also remain in early twenties. Monsoon season starts in June and lasts till September. As said earlier due to its interior location, Baramati does not witness much rain and temperatures remain moderate. Best time to visit Baramati is from October to March as temperatures remain comfortable. Visitors willing to travel to the place during January or February must carry warm clothes.